Evening Vauxhall Dresses, October 1795. The Gallery of Fashion. 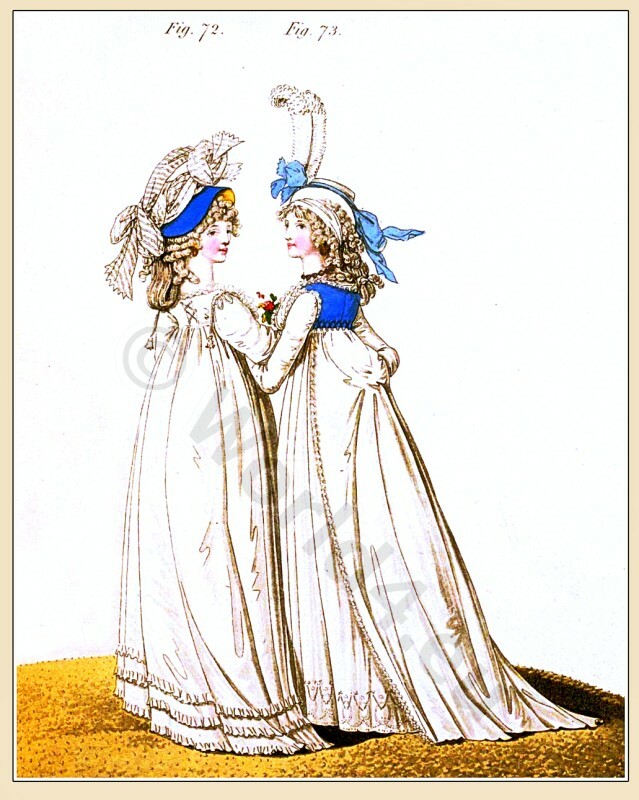 Home » Evening Vauxhall Dresses, October 1795. The Gallery of Fashion. 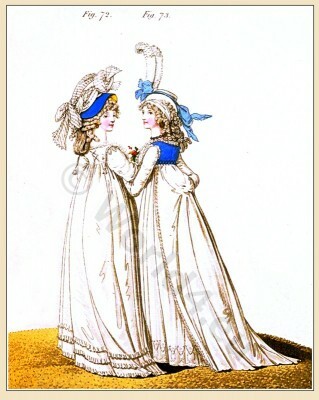 Evening Vauxhall Dresses October 1795. The front and side hair dressed into a variety of small and large curls; the hind hair turned up into a large plain chignon. Azure blue satin bonnet, lined with yellow, and trimmed with figured muslin. Round gown of India muslin, trimmed round the neck with lace. The hind part of the body and the shoulders trimmed with white silk chain, buttons, loops and tassels. Triple flounce at the bottom. Short loose sleeves, trimmed with broad lace. Gold ear-rings. White gloves. Light blue shoes, embroidered in silver. Part of the front hair combed down, the other part dressed into small curls; the side hair and some of the hind hair into larger ones; the rest of the hind hair turned up plain, the ends returned in ringlets, and ornamented with a small white satin rosette. White muslin handkerchief drawn through the hair and pinned behind. White silk hat, trimmed with azure blue crape. White ostrich feather, curled at the top, placed on the right side near the front. Petticoat of white lawn, the bottom richly worked. Body of blue taffeta, trimmed behind with black silk chain and buttons. White satin’ sleeves. Train of clear lawn. The body and train trimmed with lace. White muslin handkerchief. Gold ear-rings. Gold chain, intermixed with large pearls, round the neck. White Glows. White satin shoes, embroidered in silver.